The Gatehouse Tavern shows every major sporting event on two televisions and a six foot projector screen. Favourites sports include Rugby, Speedway and Football. Join us for the best atmosphere in town. 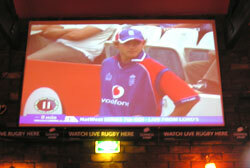 The Gatehouse Tavern has strong links to local rugby clubs and shows all the major professional games. The Gatehouse Tavern is one of the only pubs in Coventry to regularly show the high octane races of Speedway. Football is popular at The Gatehouse Tavern, so join us for all the all the major matches.